Barcelona's planned £495m (600m euros) redevelopment of the Nou Camp will go ahead after more than 27,000 of the Spanish club's members voted in favour. Europe's largest football stadium will be increased from a 99,354 capacity to 105,000 by 2021, and a roof built to cover the ground. The club is collectively owned by 160,000 members, with 72% of a low 37,535 turnout backing the proposal. "A key factor behind Barca's desire to update the Nou Camp is their need to take greater advantage of the opportunities available in the highly lucrative corporate hospitality market. "Barcelona is one of the world's most popular destinations for big-money trade shows, and the chance to attract more high-paying business customers is a major potential revenue stream for the club. "The current Nou Camp's facilities in that regard are woefully inadequate, and it's notable that the plans released by the club on Monday include 'a new ring of boxes, restaurants and other VIP facilities' with the addition of 3,500 new corporate seats." "It has been a historic day," said president Josep Maria Bartomeu. "This is a big step forward for Barcelona," he added. The approval is a boost for Bartomeu and the Barcelona board after a series of scandals that have affected the Catalan club in recent months. This week, they were given a 14-month transfer ban by football's world governing body Fifa for breaching transfer regulations in signing young overseas players. Bartomeu added: "In 2021 we will have a Nou Camp which all Barcelona members and fans will be proud of and allow us to say we have a ground of the same level as our team. "Many members have told me that they have voted for a project which, because of their age, they will never see. 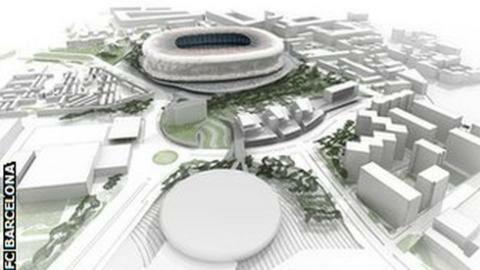 But for a better Barcelona and better Nou Camp for their grandchildren." Barcelona have played at the Nou Camp since it was built in 1957 and the stadium has hosted two European Cup finals - in 1989 and 1999. It also hosted World Cup matches in 1982 and the Olympic football tournament in 1992. Matches would still be played while the work - which is set to begin in 2017 - is carried out. The Spanish champions insist the restructured stadium will still be known as the Nou Camp, but added naming rights could be sold. The club said the redevelopment, which will see a roof built to cover all spectators but not the playing surface, would generate an extra £24m of revenue per season. Board member Javier Faus, who added the cost of the redevelopment would be repaid within eight years, said the move was necessary for Barca to continue competing with Europe's other leading clubs.